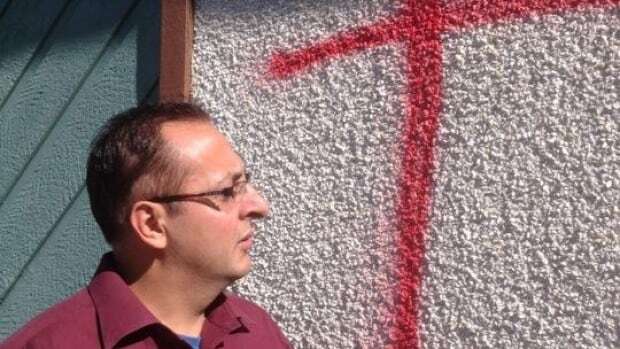 Members of Fort Saskatchewan’s Muslim community are once again cleaning up after a home that they use for prayer was vandalized with anti-Islam insults twice in the past week. Waseem Akhtar, who lives in the home, awoke to the sounds of something striking the side of the building early Monday morning. “They hit some stuff outside of my bedroom. And then, I opened my window curtain…and they just ran away,” Akhtar said. When he went outside to look, he found his home had been pelted with eggs; many of the bits of eggshells spread across his lawn had anti-Muslim insults written on them in marker. Less than a week earlier, on the anniversary of the September 11th attacks in New York, vandals spray-painted a red cross on the side of Akhtar’s home. He says that one of his housemates has moved out of fear. Akhtar worries that he hasn’t seen the last of it.